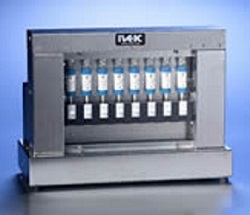 IVEK’S Multiplex dispensing system provides controlled multiple channel precision dispensing for applications where simultaneous delivery of fluid is desired. The system features a high-resolution servo controlled actuator that can control up to 12 ceramic pump modules at once. Each module is a positive displacement mechanism that includes precision ceramic pistons that are mated with ceramic cylinders. Standard clearances are tight enough to eliminate the need for secondary seals. Custom seals and clearances can be included, as each application requires. The individual piston/cylinder sets also include a separate ceramic rotary valve that is individually controlled in the system. The result is a three-piece pump module that can be individually enabled/disabled through the control of each rotary valve. This system can deliver volumes from the sub-microliter range up to 4 milliliters in a single stroke. All parameters are digitally selected through an RS232 computer signal or a touchscreen. This system features the ultimate in accuracy and repeatability, and the efficiently engineered design results in an economical per channel price.